Is There a Double Double Standard For Calgary Police? 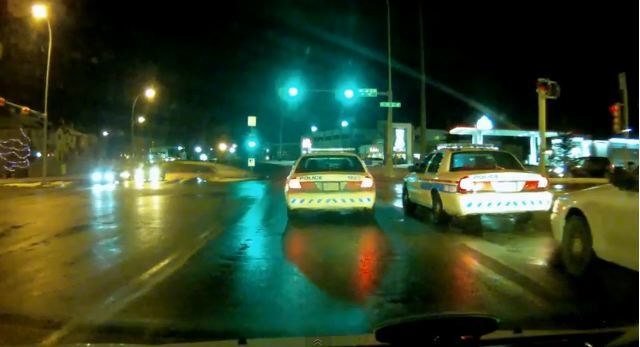 We’ve all seen the video of the Calgary Police officers “street racing” to the local Tim Hortons that was first posted on our forums before spreading like wildfire across social media. It has since made it onto the pages of Yahoo News drawing tens of thousands of viewers to the video on youtube. I put street racing in quotes because anyone with a shred of common sense knows there was no racing, speeding maybe but even then it was likely within 5-10 km/h of the posted limit. “I’ve noticed that the speeds for two of the police vehicles [did not make] it to 50 kilometres per hour, but there’s one vehicle there that we’re looking at what he was doing and what his intentions were at that point in time. What does speed have to do with it? Is Hanson saying that you must be speeding to be racing? or you must be speeding to receive a stunting ticket? The Calgary Police Service should save their time by not investigating the actions of this officer because we can all agree what he did was harmless. Instead, resources should be put together to look into all the stunting and racing tickets that have been issued over the past 5 years to see how many of them did not involve speeding. Personally I think most people are missing an important issue that is raised with this video. While it seems nearly everyone is saying that it is no big deal, they miss the fact that tickets are written (probably daily during the summer) for the exact scenario that is played out with the race to Tim Hortons. I hope the officer does not receive any serious disciplinary action for what he did. I do however hope there is no double standard when it comes to ordinary citizens that are pulled over and ticketed for doing the same thing. As citizens we must take a day off (unpaid) to attend court, while the lead footed officer was likely spoken to for 20-30 minutes, while being paid I might add. The Ontario Goverment strikes again with another new law aimed at drivers. 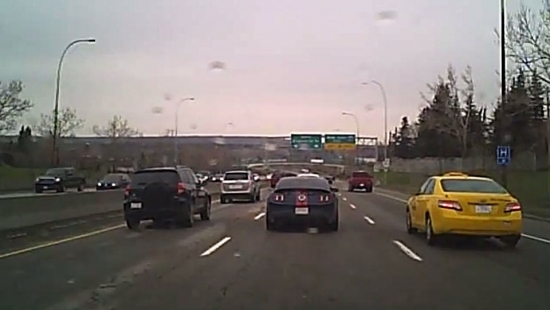 You may remember that Ontario enacted a very controversial street racing law back June of 2007 that allows Police officers to charge drivers with street racing if they exceed the speed limit by more than 50 km/h even if there are no other drivers present. This time, the Ontario Government is proposing a law that will make drivers pay for all damages if they crash in bad weather. While I do agree that drivers that are driving far too fast for the conditions should be on the hook, I question how effectively this new proposal would be enforced. Would drivers be given the benefit of doubt or would they be assumed guilty with no appeal like the existing street racing law? Does the responding officer make the call or is it up the insurance companies? Does it matter? When I worked on the Municipal Traffic Section in Penticton about 15 years ago I watched a young man on a motorcycle ahead of me in traffic on the summertime busy main street. He was first in line at a red light and when it turned green he cranked on the throttle and roared off down the street balanced on the rear wheel with the front one about three feet off the ground. I chased him down and ticketed him for his actions. A parade is far different than summer traffic conditions in a vacation city, but it was far too late to change his mind at that point. Fast forward to last September in Ontario and the implementation of Bill 203, the Safer Roads for a Safer Ontario Act. This type of behaviour will result in a fine of between $2000 and $10,000, immediate 7 day driver’s licence prohibition and 7 day vehicle impoundment. This legislation was recently cited as the major factor in a significant drop in fatal collisions on Ontario highways because of vigorous application by the police. The new legislation deals with actions such as the one I described, racing, speed more than 50 km/h over the posted limit, doing a burnout, driving with people not properly seated in seats, very close tailgating and more. In short, driving behaviours that are not something a reasonable and prudent driver would do that put themselves and others at risk. In contrast, the section I had used was 144(1)(a), driving without due care and attention, which is the only applicable general section of the Motor Vehicle Act aside from driving without reasonable consideration for others using the highway. Since then, I have been cautioned by members of the judiciary that these two sections are difficult to apply to a situation such as this one. Had something similar to the Ontario legislation been available for me to use, the outcome of the trial might have been much different. Perhaps British Columbia should consider making Ontario’s legislation an amendment to our Motor Vehicle Act. The penalty is harsh if you misbehave but if it would result in a significant reduction in fatalities on our highways the pain suffered by offenders would be preferable the pain suffered by next of kin. Abuse Of Power or Effective Law? Ontario introduced a controversial street racing law last year that gave police the power to seize vehicles and driver’s licenses if drivers were charged with street racing or stunting. According to statistics kept by the Ministry of the Attorney General in Ontario and published by CBC News police had laid 5,139 street racing or stunt driving charges since the law was enacted on Oct. 1, 2007. However, only 1080 of those cases made it to trial and only 325 resulted in convictions. 526 of them were reduced to speeding tickets (probably what they should have been in the first place). The trouble with all of this is that those who are charged with the new law face hefty fees in the form of towing and storage charges for their seized vehicles. George Papazov is one of these victims of the new law. Papazov was charged with stunt driving when he rode his motorcycle between lanes of cars stuck in traffic so he could get to his exit. In court, the judge did not agree with the charges and instead was issued a citation for an illegal lane change and fined $600. His tow charges totalled $1,000. While nobody is debating the fact that Papazov was lane splitting, I think a charge of stunt driving resulting in over $1,000 in towing fees before he has his day in court is wrong. Even the judge agrees. I’m all for bad drivers getting the punishment they deserve, but this new street racing law accomplishes nothing other than revenue generation. In the blink of an eye, four supercars were destroyed in separate incidents. Pictured above, a Lamborghini Murcielago, joined a Techart Porsche 911, an Ultima GTR and a Ferrari Testarossa on their journey to automotive heaven.